Through our goalkeeper coaching J4K has helped countless young goalkeepers achieve their dream of playing for a professional soccer/football club, from being on trial, schoolboy (or girl! ), scholars, apprenticeships. even scholarships in the USA! 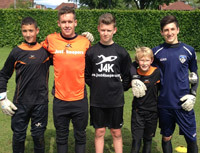 EVEN professional and INTERNATIONAL goalkeepers have hailed from J4K through our unique training system! Even though we are independent of any professional soccer/football club, such is our success rate we are continually getting called up by professional football clubs, who are after goalkeepers who have been through our unique coaching system! PLEASE PLEASE read to the bottom. you will be amazed at the J4K success! 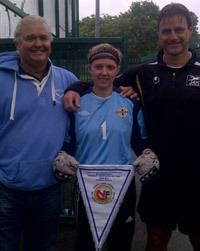 Just 4 Keepers Manchester Goalkeepers! Just4keepers penalty sessions really do pay off! 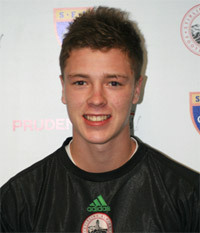 This a Daniel East who attended Just4keepers for 3 years. 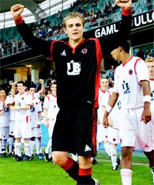 He now plays for Wolves on a 2 year Scholarship and this is him winning the Gothia Cup in Sweden. Justin Bowley does it yet again! 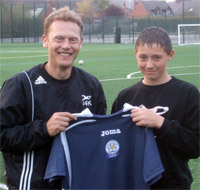 J4K Coach Justin Bowley congratulates another one of his students Charlie Andrews who has signed a 2 year deal at Leicester City FC. Well Done Charlie and best of luck from your J4K team mates. J4K gets ANOTHER J4K Student International! 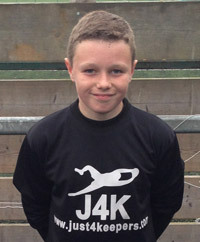 Lewis Fielding who has attended J4K with Ron and Scot Healy has just signed scholarship at Bolton Wanderers FC! And has also just been picked for England U16s! Lewis is very grateful to all at J4K for giving him the first class coaching he needed to move him closer to professional football. A special thanks to Ron and Scott at J4K at Manchester who gave him the training and confidence he needed to push further. This time they have helped Michael Doran from Liverpool get a scholarship with one of the best universities in New York State. Michael has attended J4K since he was 10 years old, now age 18 all his hard work is about to pay dividends as he realises his dream of playing in the USA thanks to J4K and our partner’s collegesportusa. Justin Bowley does it again! Justin congratulating another one of his students. Elliot Bosch becomes J4K 250th success story! 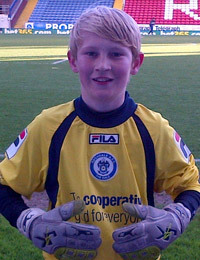 Elliot has just signed a 2 year deal with Notts County, well done Elliot! 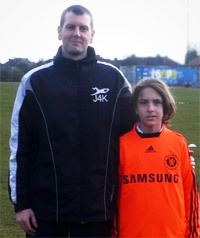 J4K Coach Jason Jamal picture with his student Roland Kiss who now attends Chelsea academy! 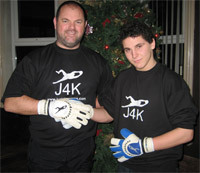 J4K Founder Ray Newland, congratulates Luke Pybis as Just4Keepers sponsor Luke for his goalkeeper gloves. Luke is currently at Tranmere Rovers and plays for Liverpool Schoolboys and seems to have a very bright future ahead of him. Ian Mcloughlin is currently Ipswich Towns No2 and J4K Dublin coach Matt Gregg states..
Just4keepers Student gets Leicester Deal! 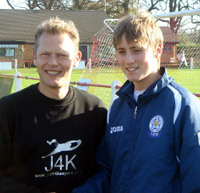 J4K coach Justin Bowley congratulates his student Liam Richards who he helped to get a 2 year deal with Leicester City. 15 months back, J4K founder Ray Newland, was invited to J4K Toronto by Riccardo Grecco to check out talent that was getting developed in Canada. 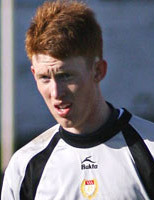 Lucas Birnstingl was immediately recognised by Ray and was recommended to a few clubs in the UK. After impressing up in Scotland, Lucas has just signed for Dundee! Thats Just4keepers 203rd goalkeeper at a professional club! J4K Kent coach Andy Woodcock celebrates with his talented student Will Sykes who has just signed for Gillingham FC. 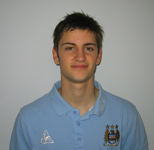 Nathan Dean attended J4k for over 3 years and has always had an amazing atitude towards his development. All of Nathan’s hard work has paid off as he has just signed a 2 year deal with Manchester City! 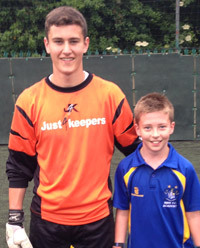 J4K want to wish Nathan the best of luck, and has tipped him to be a premiershp keeper within the next 5 years. 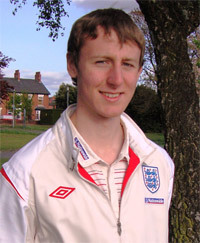 England International Hails from J4K! Adam Davies Everton and England International! 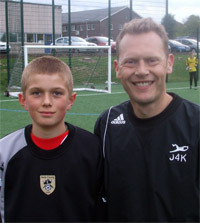 Adam Started with J4K when he was just 9 yrs old were he honed his skills for over 5 years with J4K. J4K students get picked to represent Great Britain. Catholic schools throughout the UK hold trials to pick the best goalkeepers to represent Great Britain schools, and this year (2007) out the whole of the UK, they needed just two keepers for their Great Britain squad. So what and honour it was for J4K for the two keepers to be picked out of the whole of the UK to come out of our Just4Keepers goalkeeper coaching academy. 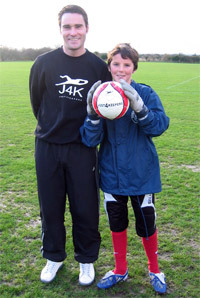 Matty Edwards started with J4K when he was 10 years old and trained with J4K for four years. J4K recommended that Man United should sign him (which they did for two seasons). Mat has now signed for Leeds United were he has represented their reserve team! Paul was trained by J4K Founder Ray Newland and impressed enough to win a scholarship to Central Connecticut State University USA. 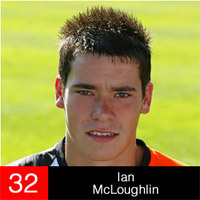 He has done that well in the USA he is currently having trials with Great Britain U23?s! Kevin McGivner (England International) Kevin goes to a school for special needs, and Kevin was picked to represent the National side, and has been the England No1 for three years running. He still attends J4K to this day and has been with us for 5 years!!! Calling all J4K students, because we have helped SOOOOOO many goalkeepers its difficult to remember you all, the above list only goes back 18 months believe it or not out of the 7 years J4K has been running, so if we have missed your name out in this section, please call J4K and we will add your details to our hall of fame! If you are a goalkeeper in Dorset and Somerset of ANY AGE who wants to be sponsored for his/her goalkeeper gloves by Just4keepers, send J4K an email and we will see if we can help you. Over the years we and our goalkeeper students have paid through our noses for high priced goalkeeper gloves. So in 2009 we decided to bring out our own glove range at VERY FAIR prices. All our gloves have been tested by professional goalkeepers to make certain our gloves are top professional quality. So we are very proud to say that we have achieved are goal of producing top professional goalkeeper gloves at very fair prices. Please Note: If you are a Just4keepers Goalkeeper Student you will get your gloves for up to 50% cheaper than the price quoted on our website. So, What are the best gloves to buy? If i am to be 100% honest, all gloves are the same and most are made in the same factories! The reason why I know this, is because J4K have spent the last 12 months developing our gloves , I have seen where most gloves are produced and manufactured, which is the same factory as J4K’s! So if they are all more or less the same, what gloves should you buy? 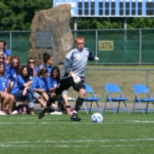 Like most keepers, you will have your favorite glove. But the chances are if you look at other gloves on the market, you can find the SAME SPECIFICATION GLOVE in another brand for sometimes half the price! Without trying to plug the J4K Pro glove, (As i am using this just as an example) it is a £35 glove. But other gloves on the market with the same design go for £70+ ! Simply put, we put less mark up on our gloves! I hope this J4K Tip helps! Please can you pass this information onto your keepers, and get them sponsored with J4K quick (We have already sponsored 1000 keepers in the South West)! !